Venezuela has arrived at a dead end. It is mired in misrule, socio-economic chaos, unchecked crime and a spiraling humanitarian catastrophe that is leading to steady exodus of its population. The immediate causes of these were shortages in food, water, electricity and medicine, as well as hyperinflation (3 million percent per year) in an economy that has shrunk by half since 2014. But the deeper-rooted cause is the tyranny exercised by the country's socialist regime, kept in power by the armed forces and Cuban intelligence, and methods that include arbitrary detentions, persecution and torture of opponents. Its institutional situation is both grim and confusing. The National Assembly (elected in 2015, but with an opposition majority the government has declared invalid), announced in February that President Nicolás Maduro's present term was illegitimate and, citing the constitution, installed its Speaker Juan Guaidó as acting president in order to defy Maduro and hasten his downfall. More than 50 states recognize Guaidó as acting president, even as Maduro's government has just declared a ban from him holding any elected office. The country thus has two presidents, two legislatures and two supreme courts. In several countries of the Organization of American States (OAS), Venezuela has two ambassadors. With Guaidó's arrival, some optimistically declared that the dictatorship would soon end and peace and democracy would be restored. They overlooked the grit and determination of regime supporters, senior army officers and Cuban agents to ensure Maduro retains power. Avoiding any genuine electoral contest, which they know they would lose, would force many of these regime supporters to go into exile or prison. The situation is one of total, suffocating uncertainty. Nobody knows when or how it might end. Still, hard thinking can help us imagine different scenarios, some that involve regime change and others that ensure continuity. These outcomes are not in any order of likelihood, nor necessarily exclusive. One or more could happen simultaneously. 1. The status quo prevails indefinitely, with a regime resisting calls for democratization or humanitarian aid, and forcefully retaining power in the manner of its Cuban mentors, with Russian and Chinese help. At the end of this presidential term, the regime calls a general election. 2. International sanctions spread to trading and financial transactions, and come to include an end to U.S. imports of Venezuelan oil. This curbs the regime's revenues (by 80%) or cuts them off entirely. The economy collapses. 3. The regime's ability to provide services, subsidize its reduced public support base and bribe army commanders is significantly reduced. This irritates regime pillars and undermines their loyalty. Implosion occurs or a street revolt breaks out involving mid-ranking officers who demand Maduro's resignation. Or, they depose the president and assume power. 4. Internal pressure and international isolation intensify, while Russia and China have growing doubts on the regime's viability. 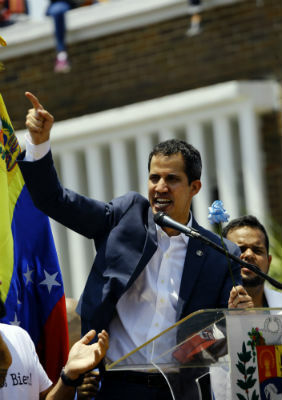 Guaidó's domestic and outside popularity grows, as does his ability to mobilize the population and generate support or discontent among soldiers. The regime starts to wobble. Maduro negotiates with Guaidó, holding genuine elections with international observers, or resigning and peacefully leaving the country, with immunity or impunity for his supporters. Guaidó assumes the presidency properly and calls a general election. 5. Repression intensifies and the humanitarian and migratory crises worsen. Clashes multiply on the border, increasingly affecting the security and stability of neighboring states. The Lima Group, with support from the United States and the European Union, asks the UN Security Council to authorize the organization of a humanitarian intervention force in the Responsibility to Protect framework. With or without UN approval, an Inter-American Humanitarian Force is formed under OAS aegis, and Guaidó authorizes its entry (Article 187 of the Venezuelan Constitution). 6. The United States boosts its commercial, financial and diplomatic blockade. Maduro asks for talks, and direct negotiations begin with the Trump administration to organize legitimate elections, or the departure of Maduro and his allies. 7. Army deserters (already 1,000) form an insurgent group with outside help (financing, advice and arms), to begin a rebellion and topple the government, like the Nicaraguan Contras in the 1990s. 8. Tensions and conflict grow on the borders, threatening regional stability. The United States intervenes unilaterally to dislodge the regime, in the manner of the invasions of Grenada (1983) and Panama (1989), with unpredictable consequences.